Philip Manning is this year’s Don Chrysler Concerto Competition winner, and we are looking forward to hearing him play Max Bruch’s wonderful First Violin Concerto in our concerts on 30 and 31 October. This young man of eighteen has already had some notable successes. He told High Notes that, in particular, playing the Victoria Symphony Splash last summer was a unique experience—the outdoor venue, the beautiful August evening, the thousands of people everywhere on shore. Philip has been playing the violin since he was six, when he began lessons with Carol McIsaac. His current teacher is Robert Skelton, of Mill Bay. Philip was born in Victoria. His grandfather played clarinet and saxophone, and his mother plays piano. He has a younger brother who also plays piano. He is a graduate of Lighthouse Academy and lives in Metchosin. 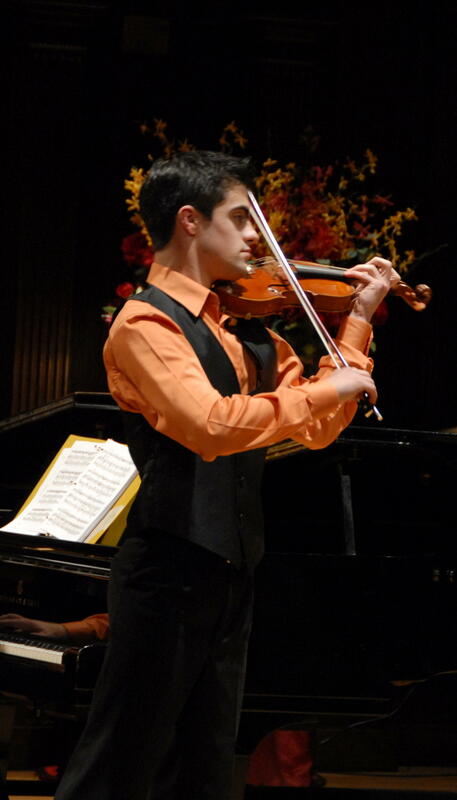 He enjoyed playing in a piano trio, Trio Tesoro, for three years,; in 2008 the three young musicians traveled to Edmonton to take part in the National Music Festival. At present he is attending Camosun College, taking a few non-music electives. He is interested in political science and intends to take a course in this subject in January. He plans to continue his post-secondary studies in music in September 2011. Philip says he loves the Bruch (which doesn’t surprise us) and named the slow movement in particular as a musical jewel. That was what he played at the Symphony Splash. See you this coming Saturday in Sooke, and Sunday in Victoria. No need to bring a blanket.